Author Dan Power has spent almost 30 years building, studying and teaching others about computerized Decision Support Systems. Dr. Power is first and foremost a Decision Support evangelist and generalist. From his vantage point as editor of DSSResources.COM, he tracks a broad range of contemporary DSS topics. Decision support systems, Decision making. 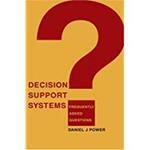 Power, Daniel, "Decision Support Systems: Frequently Asked Questions" (2005). Faculty Book Gallery. 448.